Choosing an immigration attorney to help you with the K-1 Visa process is an important decision. Consider the factors discussed below as you make your decision. If you found this page you’re probably considering hiring an attorney to help you with the K-1 or K-3 Fiancé or Marriage Visa process. It’s likely you’ve already read about fiancé visa fees and requirements, the length of time it takes to get through the visa process, and potential pitfalls that you’d like to avoid as you file the application, enter the U.S., or get interviewed. We think it’s wise to get an immigration attorney to help you through this process, regardless of you’re experience level with the law or even immigration law. Getting married is an emotional experience. For that reason, it’s important to have someone represent you who can provide an objective perspective and take care of the boring, frustrating, and unexciting details of the accompanying immigration process. However, as you continue to consider which immigration attorney to hire and help you with the K-1 visa process, think about the following important details. All of the immigration forms you need to start the Marriage and Fiancé visa process are free and publicly available on government websites. It’s entirely possible to go through the fiancé visa process by yourself without the assistance of an immigration attorney…we just wouldn’t advise it. Sure, if you’re studious, good with paperwork, and you are the kind of person who just stays organized you may very well be fine. But even if you’re good with paperwork, wrapping your mind around the legal jargon, the differences in how certain laws apply to different situations, and the nuance in how a minor problem can derail your application might make you want to hire a K-1 Fiancé Visa attorney. I’ll share a story of a personal friend just by way of explanation. All names in this very true story have been changed. Robert, a high-powered civil litigation attorney, had recently lost his wife to cancer. Years passed and Robert decided to tour Europe. While there, he met and fell in love with Natasha, a well-educated Russian classical pianist. Natasha and Robert decided to make a life together in the United States. Robert, being an attorney, felt that he could manage the immigration process. Robert and Natasha entered the United States together with Natasha on a B-2 Visitor Visa. Originally they had planned to spend more time meeting family and friends in both countries prior to getting married but decided they couldn’t wait any longer. While in the U.S., Robert and Natasha married and then filed the I-130, Petition for Alien spouse and the I-485, Application to Adjust Status at the same time. At the Green Card interview, the interviewer asked if Natasha had ever been a prostitute. Robert was extremely offended by something that is, frankly, a routine question. An experienced immigration attorney might have prepared him for that one. Instead, the interview devolved into a shouting match where the interviewer accused the couple of committing visa fraud because Natasha had entered on a tourist visa with the intent to get married and remain in the U.S. and denied the green card. An immigration lawyer’s experience with issues that may seem small to you, but which can make all the difference in your application, is why it can be worth it to hire a K-1 visa lawyer regardless of your background. The first step in hiring a lawyer to help you with the K-1 fiancé visa process, is to reach out and talk to a few. You should have the opportunity to speak to a licensed attorney before you begin receiving representation. Many fly-by-night outfits offer seemingly low prices to help you with a K-1 visa (like say, $600 or less), but it’s important to note that some of these “services” do little more than fill out and file the application on your behalf. If you don’t have the opportunity to talk to an attorney at the beginning of the process, you probably won’t be able to get legal advice and help in the middle of the process when additional questions or concerns arise. We always have a consultation with each client before we begin representing them. Some clients consult with many immigration attorneys before deciding to continue with us while others hire us immediately after a consultation. What’s interesting about immigration law, and beneficial to you as a client, is that immigration law is federally preempted. This means that individual states don’t make immigration laws. As a result, any lawyer licensed by any state in the United States can represent you in your immigration matter. Live in Alaska? 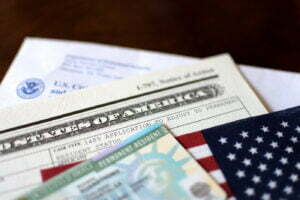 You can hire an immigration attorney in Florida. Live in Texas? Hire a K-1 fiancé visa attorney in Virginia. (By the way, we’re based out of Richmond, VA). What this means for you is that you have options, and it’s perfectly reasonable to feel some of those options out by speaking with a few lawyers. Some attorneys charge for a consultation, while others (like us!) may provide consultations. Whether you pay for a consultation or not, it’s important that you be prepared with the right questions. The list that follows isn’t necessarily comprehensive, but it’s a good idea to think about issues like price, experience, communication, and more. Also, it’s important that you like the attorney–you’ll be working with this person for at least six months and possibly longer than a year. Can I get a price estimate? (If you can’t get a straight answer to these last two, just move on). How do I get ahold of you? Will you answer the phone, or a secretary? How long does it typically take you to respond to a phone call or email? Are there any problems with my case that I should know before I get started? How much do you charge for administrative stuff, like copies, mail, etc.? As we mentioned above, you can work with an immigration attorney no matter where you or the attorney is located. We are based out of Richmond, VA but we work with clients from around the United States and the world. We hope that you’ll choose to work with us. So let’s talk about some of the benefits we bring to your case. First of all, we feel that we are not just good lawyers, but our clients tell us we are also good people. If you’re going to be working with an attorney for more than a year, you want to make sure you get along with that attorney. We make every effort to be personable, relaxed, and informative. Also, we don’t like to work with people that stress us out just as much as you don’t like it. Being great with laws, but even better with people, is just part of our philosophy as a firm. Another benefit of working with a Tingen & Williams K-1 fiancé visa attorney is that we have a firm-wide commitment to respond to every contact within 1 business day. Of note, one of the largest complaints about attorneys across jurisdictions in the U.S. is that they don’t respond within a sufficient amount of time. We’re doing our best to make a difference in how we provide legal services by leveraging modern technology. We know that clients don’t want to check the mail to get a message from their attorney–you would rather read an email on your smartphone. You’d prefer not to mail a check, but login into a secure online system where you can view your bill, bring up questions about it, and make payments online. You would like to be able to ask a legal question whenever it occurs to you, leave a quick message for your attorney, and have the answer sent directly to your email inbox in less than 1 business day. If this sounds like you, then we might just be the right fit for you. In addition to making it easy for existing clients to ask questions and get answers, we constantly update our website with new information about the law and our areas of expertise. We put all this information in our legal information knowledgebase, a growing resource that thousands upon thousands of website visitors view each month to get the answers they need. One reason many of our clients love us is that we are open about price and because we provide affordable payment plans. Hiring a K-1 visa lawyer can be expensive. The mentality of many immigration attorneys is that the client should pay the entire legal bill up front. Other plans include paying half up front and the other half after the application is sent. We don’t follow either of those philosophies. Instead, we allow you to divide your legal bill into equal monthly payments so that you can get started today and pay over time. Thank you for reading about K-1 visa attorneys in general, and for considering hiring us to help you as your immigration attorney. This is an important decision and there is a lot to think about, especially when you’re getting married. While you can hire virtually any licensed immigration attorney throughout the United States, we feel that our immigration experience and technology expertise make us an ideal fit for the 21st century client–clients like you who are on the go and need quick answers. Let us make your life simpler. You worry about your wedding, let us worry about your K-1 visa process.